Comfortable, Beautiful Cottage - close to the beach, perfect for families! Property 3: Comfortable, Beautiful Cottage - close to the beach, perfect for families! 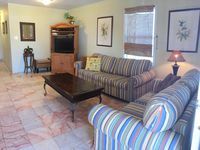 Quiet, upscale condo w/shared pool, hot tub, & picnic area - dogs welcome! Property 6: Quiet, upscale condo w/shared pool, hot tub, & picnic area - dogs welcome! Close to the beach and public boat launch. Nice view of the bay and sunsets.